FULTON, NY – The Fulton War Memorial will host Catholic Charities’ CYO Rock the Rim for Youth Basketball Tournament on May 21 beginning at 3 p.m. Representatives of the Fulton Parks and Recreation Department welcome members of the planning committee for Catholic Charities’ CYO Rock the Rim for Youth Basketball Tournament to discuss details for the event. 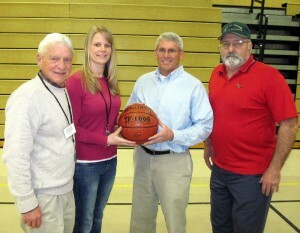 From left are: Jim Smiley, director of Catholic Charities’ CYO Program; Stacie Roberts, CYO mentoring coordinator; Barry Ostrander, superintendent and Jerry Schremp, recreation maintenance supervisor with the Fulton Parks and Recreation Department. Featuring competition for all ages, the CYO Rock the Rim for Youth Basketball Tournament offers two brackets competition, ages 16 – 30 and 30 and over with a limit of eight teams per bracket. For younger players there will be a shoot-out for youth ages 5 – 7, 8 – 10, 11 – 12, and 13- 15. Prizes will be awarded to the winners of each bracket and all youth participating in the shoot-out will receive an award. The tournament is open to both men and women as co-ed teams are welcome. The event serves as a fundraiser for Catholic Charities popular CYO program that provides area youth with a safe, well supervised, friendly environment and offers a variety of programs that promote positive development including; an after school program, a mentoring program, summer recreation and a Saturday drop in program that offers youth the opportunity for healthy interaction with their peers. However, according to the Executive Director of Catholic Charities of Oswego County, Mary-Margaret Pezzella-Pekow, recent budget cuts have left the CYO program in desperate in needs of funds. “While many area youth and their parents utilize the programs offered through CYO recent budget cuts have put the program in jeopardy. We need community support to continue to offer our CYO program and I am looking forward to the stands filled with community members cheering for favorite teams and lending their support to worthwhile program that does so much for our youth and their families,” said Pezzella-Pekow. CYO director Jim Smiley hopes to see some of his past CYO members on the court once again. “It would be great to have some of our many former CYO members participating in the tournament and supporting a program that means so much to our youth. I encourage them to join us and I invite community members to have their children take part in our Youth Shoot-Out and enjoy an afternoon of basketball for a good cause,” said Smiley. “I’d also like to thank the city of Fulton; Barry Ostrander, parks and recreation superintendent; and Jerry Schremp, recreation maintenance supervisor for their support of the CYO Rock the Rim for Youth Basketball Tournament and allowing us to use the Fulton War Memorial,” added Smiley. Tip-off for the tournament is set for 3 p.m. Registration fee is $150 per team with a maximum of 8 players per team and includes a commemorative T-shirt for each team member. For a $1 donation, participants in the youth shoot-out will receive 5 shots. For more information, call Meghan Rey at 598-3980, ext. 222.